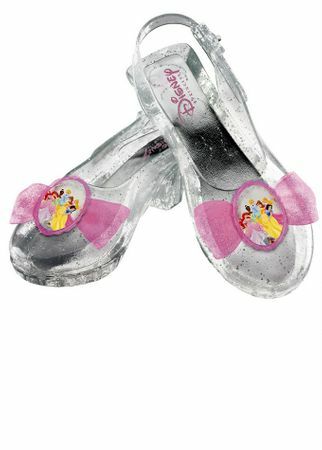 One pair of child's Disney princess clear sparkle dress-up shoes. Clear glitter "jelly" shoes feature an adjustable slingback strap, 1-inch heel, and sheer pink bow on the toe with multi-princess pink plastic jewel cameo. 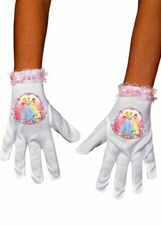 Fun for dress up play, Halloween or being a Princess for a day at a birthday party. One size fits most kids age 4+; shoes measure 7.5 inches long and 2.75 inches wide.